Hello — I’m Keith A. Spencer, a cultural critic, essayist, and editor at Salon.com, where I manage the sci/tech vertical. I’m a generalist as far as editors go, though I have a background in the sciences that has led me to comment extensively on the politics of science and technology, with a focus on the politics of space colonization, the cultural and social ramifications of the tech industry, and the sociology of Burning Man. 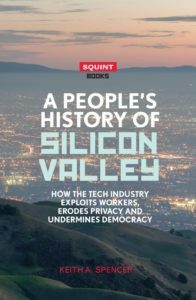 My new book, “A People’s History of Silicon Valley: How the Tech Industry Exploits Workers, Erodes Privacy and Undermines Democracy” was released in late 2018 from Squint Books. You can order it here, read an excerpt here, or find an interview with me about the book here or here. Previously I was editor-in-chief of The Bold Italic, a Bay Area–centric, New Journalism culture magazine owned by Medium. I write fiction and humor under the byline K.A. Spencer. Fiction was and still is my original love; I’m a novelist who accidentally became a critic and news editor. I’m available for speaking engagements, podcast interviews and writing commissions on a limited basis (I have a contract with Salon that limits what I can write for other online publications; reach out for more specific details). My writing has appeared in Jacobin, McSweeney’s Internet Tendency, Dissent, Alternet, Full-Stop, and a few dry academic journals with anodyne titles. I have an essay coming out in 2019 in the academic book “Aliens in Popular Culture: A Guide for Visitors from Outer Space.” Previously an artist-in-residence at ArtSpan in San Francisco, I practice conceptual art and performance art. Recent interviews include the Huffington Post, on R.J. Eskow’s podcast The Zero Hour, the podcast Future Left, and by Meghan McCain on America Now Radio. In 2016, I was selected as one of 100 international “Leaders of Tomorrow” by St. Gallen University’s St. Gallen Symposium. Prior to working in media, I wrote three novels, served as a research assistant on gamma-ray and radioastronomy projects, and taught high school math and science. Peruse the menu to check out my portfolio or get in touch.